Previous SAT retakes in Year 7. Oh please no! 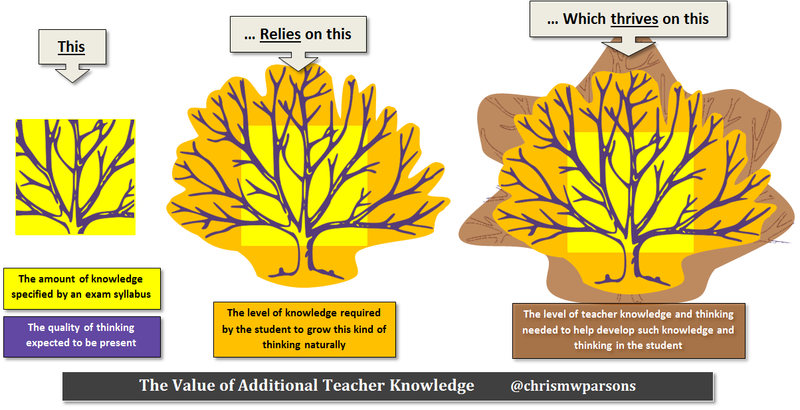 Heather – perhaps it’s the mood I’m in, but this seems to tie in extremely well with the “Class Teaching” blog posted on the same day as yours about ‘Spinning a pedgogical yarn’, as well as my blog from last week about ‘Remodelling the Ideal teacher’ – in particular my diagram about the value of extended teacher knowledge linked to below. Thanks – It’s growing a brilliant ‘whole’ within me at present. I really like that. Makes sense to me! This has a certain overlap with the series of blogposts by Kris Boulton (e.g. https://tothereal.wordpress.com/2015/03/28/195-countries-why-all-195/) where the discussion developed into one about ‘frameworks of understanding’. In that case, whether learning all 195 capital cities and countries was desirable; but this collapses into a question about what should be the skeleton of knowledge for Geography….whereas your post is dealing with what should be the skeleton of knowledge for History. That is, constructing the framework of knowledge for History. I think. I have somehow missed Kris’s posts. I’ll take a look. I am certainly wondering what knowledge is necessary if your ultimate goal is historical analysis. I knew theoretically that it required wide background knowledge but it is interesting that I’ve found that specifically it needs a strong narrative understanding. I think so. I can’t help fearing that primary history will not change dramatically. When I have talked to KS2 teachers on the TES site they seemed very keen on the idea that chronology was a sort of generic concept you teach. It would be the most enormous culture shift for them to aim to try and build a narrative framework. Suggested reading – always worth looking at blogs written by teachers as they offer such a valuable perspective. In particular this post shows the importance of not neglecting the narrative of history in teaching. Important historical events are often interconnected to such an extent, that viewing them in isolation can be a barrier to understanding. Reblogged on Windows into History.